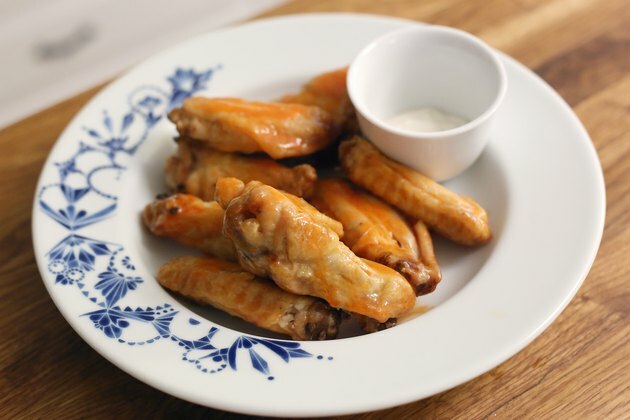 Convection ovens make chicken wings significantly healthier because the fat is able to render away from the chicken. The dry heat environment created by the oven's fan also works well for creating crispy skin that easily soaks up sauces such as barbecue or buffalo. The oven's fan forces the heat to distribute more evenly, which can drastically reduce the cooking time. Rub them down with your favorite seasonings, pop them in the oven and finish them with a sweet or spicy sauce. 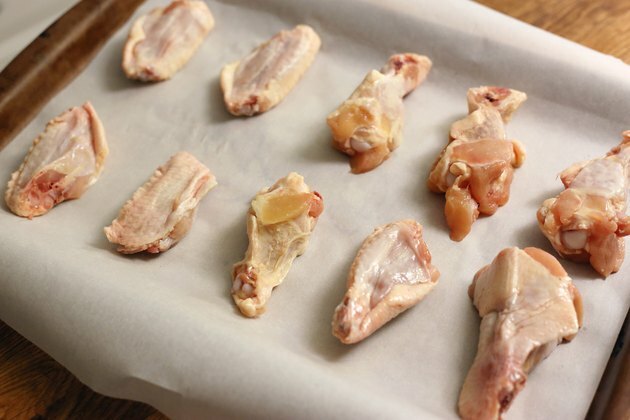 Pat the chicken wings dry with paper towels, and season them as desired. You might toss them in a bit of cooking oil and add basic spices such as salt and pepper, or you can marinate them for about 2 hours in the refrigerator. While you can purchase a wide range of bottled marinades from your local grocer, it's also easy to whip up your own marinade with basic pantry ingredients. Start with a cooking oil such as olive oil or coconut oil, whisk in an acidic ingredient such as apple cider vinegar or orange juice, add other wet ingredients as desired, such as Worcestershire sauce or teriyaki sauce and finish with your choice of dry spices. Line a baking sheet with parchment paper to prevent sticking. 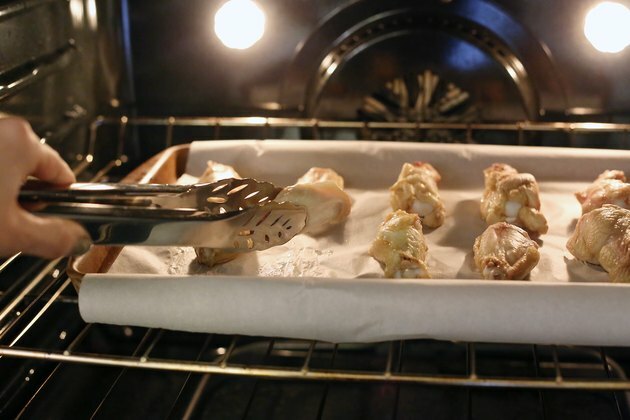 Place the chicken wings on the parchment paper, leaving a space between each piece. If you marinated the wings, allow the excess liquid to drip off before adding them to the pan. Set the convection oven to between 275 and 300 degrees Fahrenheit. 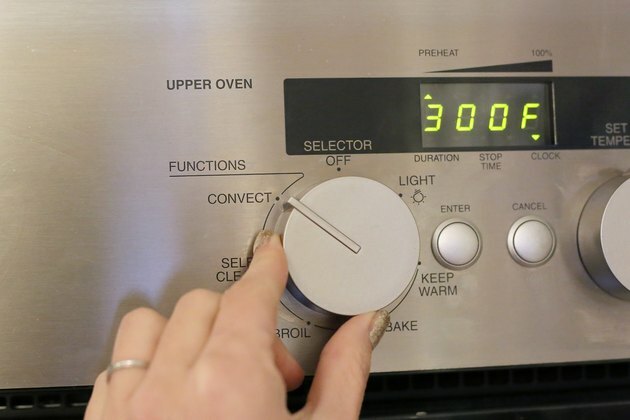 Convection ovens only require a temperature between one-fourth and one-third of the temperature in a non-convection oven, so this temperature is based off the common wing-baking temperature of 350 and 400 F.
Place the baking sheet in the oven, and bake for about 30 minutes, turning the chicken once after about 15 minutes. Just as a convection oven requires lower temperatures, it also cut the cooking time by one-fourth to one-third. 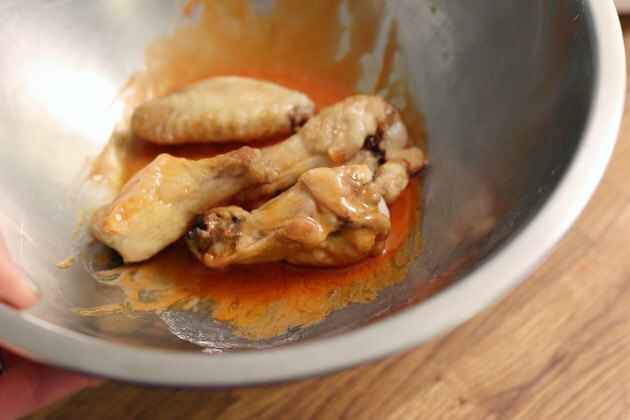 To take out the guesswork, insert a meat thermometer in the thickest part of the wings, avoiding the bone, and remove them from the oven when the internal temperature reaches a minimum of 165 F.
Pour your choice of wing sauce in a large bowl -- a large, metal mixing bowl works well for this. Add the baked wings to the bowl and toss them until evenly coated. To make a basic buffalo sauce, combine equal parts hot sauce and melted butter, along with other spices as desired, such as cayenne pepper for added heat. You might also try a sauce mixture of honey, ginger and soy sauce Asian-influenced wings, or coat them in a sweet barbecue sauce. Cook the wings on a baking rack set on the baking sheet if you have one available. A baking rack elevates the meat off the pan so air can circulate underneath, eliminating the need to flip the chicken while cooking.